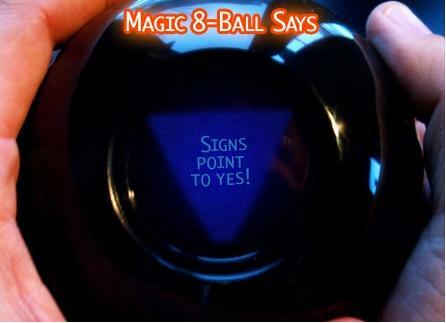 Being a leader is not simply about the magic 8-ball. There can be no doubt that the NHS without effective leadership will be (is) in trouble. There are many reports, projects, initiatives and clinicians addressing this problem whether it be by meausuring, documenting, planning or even studying the issue. What is interesting me of late is who should be undertaking leadership roles. to be an effective leader. The characteristics that separate one clinician from others and designates them as a clinical leader are not however clear. The reasons why colleagues make the move into leadership will affect their ability to deliver in this role and simply being the only volunteer, selected by rota or even the best at interview does not necessarily embue the candidate with the characteristics that are required for success. Previous blog posts have atested to the value of developing effective, employed junior managers, thru’ schemes such as the MBA, into senior managers utilising their experiences gained in the realities of the task and blending and refining this with essential knowledge delivered by experts. Embryonic clinical leaders have no experience of the realities of management, self select for many reasons not all altruistic and commence work as a necessarily part-time role with no training whatsoever. The environment in which they work is firstly foreign, secondly hostile and thirdly there are few rewards with little support. Would you like that job? For leadership to be effective the leader has to have the desire to lead the team. Whilst this may seem obvious it is very different from simply balancing budgets, developing the service or achieving targets as required by more senior levels and these priorities themselves may disengage rather than engages the team. The skills to achieve this balance with conflicting stresses are not acquired during clinical training, by osmosis or even simple good sense but take time, effort, mistakes and effective relationships to develop. Little of that is offered to the new clinical manager. The actual capacity to lead must also be questioned. In a clinical directorate with a budget of millions of pounds do we really feel that the most senior figure, the lead and the encourager can do this job on an adhoc basis even without the time to address the challenge of developing their own role? What is certain is that no-one comes to the task fully fledged or full time. This wouldn’t happen in industry. Lastly, the authority to lead is not implicit in such posts. It may be a position of managerial superiority but this only effective applies to those who consider that the management structure has this legitimacy. Unfortunately, due to the disconnect between the vast majority of clinicians and mangement, this relationship is seen (and perhaps expressed) as illegitamcy. Whether all this is true or not it perhaps addresses the fundamental problem of current “Leadership” development programmes. The concept of the programme and the development of indivuals in roles of leaders is somewhat moot until the right leaders are in the job and not just “selected” when everyone else has taken one step backwards. The vast majority of managers in the NHS have no management training whatsoever. Most are promoted from other disciplines which themselves do not include any formal management training or assessment. The few managers that do have formal training will either have a Business Administration qualification or perhaps a very small number with a Medical Management qualification. The evidence that the theories taught on such courses are worthwhile or effective is difficult to come by. Medicine is not a business. It is not run for profit nor can generate income or customers in the same way. There is poor interaction between clinicians and management. Clinicians have concerns about the level of management skills in the NHS, probably now being mirrored in senior management and the plethora of “leadership” initiatives. Semler is pointing out that Management as a science is not as proven and strong as it might be. The poor assessment of the past (albeit interpreted retrospectively) makes interpretation of management action and reaction difficult and necessarily brings into question the teaching of future managers. Now, coming from a different paradigm I am actually used to things not be quite as we are taught but not throwing my hands up and rejecting everything. Up to the early 1980’s no-one seriously believed that a bacterium could live in extreme acid environment of the human stomach. Now, it is recognised that not only does H pylori exist but thrives in pH =1 and that, contrary to established knowledge, it is the principal cause of gastric ulcers and gastric malignancies. Moving rapidly on from that new knowledge it has been found that by eradicating the bug from a stomach it might even cure those diseases within it. Medical science has recognised an error of knowledge, corrected it and progressed. Management science must also make this sort of progress. It strikes me that on a personal level this should be achieved thru’ the reflective and iterative processes of Action Research. Hegel of course is right as we seem to learn very little from history in a global sense. However history teaches us nothing only if we fail to observe the past, ask appropriate questions and learn from the results. Furthermore, if the answers we develop don’t work, we should ask the questions again and again testing our answers to see if we have made progress. It’s not rocket science really, is it? What has history taught you? edit- Bob C kindly sourced the full quote found ‘Lectures on the Philosophy of History’: “But what experience and history teach is this, – that peoples and governments never have learned anything from history, or acted on principles deduced from it.” This can be read in context here.